Select your favorite beach from the artist's Sand Bank, or send in sand from an unforgettable spot. Some days are worth remembering. 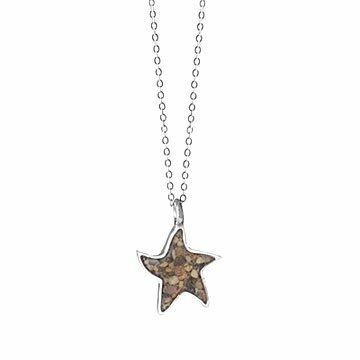 This sterling silver starfish necklace allows you to carry around the memory of a fabulous beach trip. Filled with grains of sand (you have the choice of sending in your own or having it filled by the maker), it will inevitably transport you back to hours spent soaking in a salty breeze and enjoying the sound of waves washing up on shore. Handmade by Holly Daniels Christensen in Massachusetts. Click here to see a list of available beaches in Holly's Sand Bank. If you'd like to use your own sand, we'll send you a convenient mailer with instructions. Silver naturally tarnishes so if that happens you can polish your necklace vigorously with a silver polishing cloth. Remove the polishing residue from the sandy part of your necklace with a soft cloth or brush with soap and warm water.